UN negotiators will be focusing part of their attention on the economic value of forests next week and the week after at year-end climate talks in Cancun, Mexico. Most of that attention will focus on the value of carbon stored in trees, but increasingly more attention is being paid to biodiversity values and man’s impact on them, both of which are the focus of a new book. 22 November 2010 | Dr. Toby Gardner parlays 25 years of experience in conservation science into a concrete, discernible read. His Monitoring Forest Biodiversity combines, for the first time, the themes of forest management, forest biodiversity and ecological monitoring in a manner that will provide multiple benefits for forest carbon market participants. 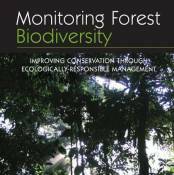 The book offers an accessible analysis with clear case studies on the context, nature and operational framework of forest biodiversity monitoring. Most important, it partners current on-the-ground applicability with a scientific framework that allows for easy repetition and monitoring. Broken into three parts, the book places forest biodiversity monitoring into an understandable context. It discusses likely challenges. And it offers a framework to achieve success. Managing Monitoring is Affordable. Let’s make it Scientific. Human activity has already impacted nearly all the Earth’s forests, Gardner explains in the first section of Monitoring Forest Biodiversity. This makes monitoring forest biodiversity a major forest-management theme for the twenty-first century. Yet, until recently, this monitoring often occurred piecemeal, without consistent criteria and indicators. Now, with the advent of increasingly affordable forest biodiversity management tools, the forest carbon market would benefit, Dr. Gardner writes, by developing scientifically inexpensive and repeatable methods to monitor forest biodiversity. A number of standards compete for legitimacy in the forest carbon market including the American Carbon Registry, the Voluntary Carbon Standard, the Climate Community Biodiversity Standard and the Climate Action Registry. This use of inconsistent standards along with inconsistent terminology and techniques has led to a struggle between projects as they vie to establish their effectiveness at disparate and often unverifiable goals, Gardner says. But as with most scientific studies, forest biodiversity monitoring can only be considered effective when clear goals and objectives are set and results are repeatable and therefore verifiable. In essence, the standards should facilitate effective monitoring protocol regardless of which standard is used because the strength of many projects are their forward-looking monitoring protocols. This will further legitimize forest carbon finance as a method to fund forest conservation because of effective and scientifically repeatable monitoring protocols that can be independently audited. The book’s final portion offers the reader a synopsis of how to develop and implement an effective forest biodiversity (and forest carbon) monitoring plan. By focusing on common frameworks with common indicators, Gardner promotes the development of consistent forest biodiversity (and forest carbon) monitoring schemes that can be implemented across forest ecotypes, scale, landowner regimes and timeframes. Monitoring Forest Biodiversity, offers a step-by-step analytical approach for forest-carbon project developers, project owners, and stakeholders. Its only shortcoming is that it leaves the reader wanting more. If the book had included an online user-friendly web-software tool readers would have had real-world instruments that allowed for the integration of tools presented within the book. This could benefit forest carbon stakeholders, allowing for adaptive oversight of forest management, forest biodiversity and ecological monitoring. And it would provide valuable open-source development for current Monitoring Reporting Verification (MRV) discussions for the public sector at the REDD Readiness Initiatives’ level and voluntary carbon market pre-compliance level for the private sector. Monitoring Forest Biodiversity is a must-read for any forest carbon practitioner who wishes to further develop our demanding field. It clearly explains how to affect large-scale, statistically significant impacts that positively influence biodiversity and the surrounding forest community based on real, repeatable, equitable, and verifiable forest carbon project management.